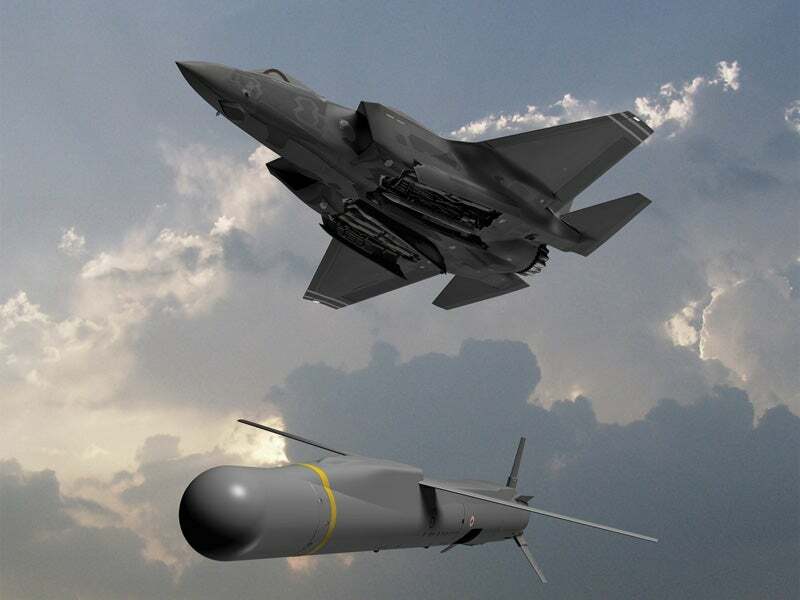 The SPEAR air-to-surface missile is being developed by MBDA for integration on F-35 combat aircraft. Image courtesy of MBDA. SPEAR was launched during the Farnborough International Air Show 2012. Image courtesy of MBDA. The SPEAR air-launched weapon can be carried in F-35B’s internal weapons. Image courtesy of Lockheed Martin. The SPEAR missile can be optionally integrated into Typhoon fighter aircraft. Image courtesy of MBDA UK Ltd. The weapon was launched during the Farnborough International Air Show held in Farnborough, England, in July 2012. It is intended for use by current and future air platforms and is capable of engaging various land-based and sea-based target types including armoured vehicles, main battle tanks, air defence units, self-propelled guns, ballistic missile launchers, high-mobility vehicles, defended structures and naval vessels. The SPEAR weapon is part of the interim Portfolio Management Agreement (PMA-I), under which MBDA has agreed to develop and supply complex weapons to the UK Armed Forces. The PMA-I was signed between the UK Ministry of Defence (MoD) and MBDA in March 2010. The precision strike missile was selected for the UK MoD’s Selected Precision Effects At Range (SPEAR) capability 3 requirement for integration on to the UK’s next-generation, F-35B, supersonic, multi-role, stealth fighter aircraft. It can be carried in the F-35B’s internal weapons bay. MBDA secured a £411m ($594.5m) contract from the UK Ministry of Defence for the development phase of the SPEAR missile in May 2016. This contract is a follow-on to the initial £150m assessment phase contract, which involved demonstration of the missile subsystems. The development is expected to be completed by 2020. The air-launched missile can also be carried on Typhoon multi-role fighter of the British Armed Forces. A successful test firing of SPEAR from the Typhoon combat aircraft was conducted at a range in West Wales in March 2016. The SPEAR air-to-ground precision strike weapon is designed to Mil Std 1760 military interface standard and is UAI-compliant. It has a length of approximately 2m and a diameter of 180mm, and weighs approximately 100kg. The stand-off weapon is capable of operating in autonomous fire-and-forget and semi-active laser designation modes. It can also be deployed in fully network-enabled combat environment with in-flight retargeting capability. When operated in fire-and-forget mode, the missile does not require further guidance from the launch platform after its launch. The fire-and-forget mode also provides the operator with the ability to engage multiple targets. A latest generation multi-effect warhead allows the SPEAR air-launched missile to destroy a variety of targets. It employs multiple fuses to provide enhanced lethal effectiveness, while reducing collateral damage. The onboard global positioning system (GPS), combined with inertial navigation system (INS), provides precise terrain awareness and accurate target tracking throughout the flight. "The onboard global positioning system (GPS), combined with inertial navigation system (INS), provides precise terrain awareness and accurate target tracking throughout the flight." A new-generation multi-mode seeker, including a semi-active laser, offers increased selectivity and operational flexibility in complex combat conditions. The semi-active laser guides the missile by tracking the target with a laser light source. A reliable, two-way data link enables the operator to update the target information during the flight. It also allows in-flight retargeting and mission abort. Powered by a turbojet propulsion system, the SPEAR air-launched attack weapon can fly at high subsonic speeds and reach a range of more than 60mi. The missile is capable of destroying targets beyond the horizon, providing high survivability for the launch aircraft. It can engage targets in all weather conditions, both during the day and at night.